It’s 12.45pm when we roll down into Oban. Yes we could have stayed in a hotel, yes we could have kept civilised hours but one way or another we had to make the 480-mile trip, so departure was at 4am and unsurprisingly, the traffic was light. We stock up in the supermarket, meals are planned on the hoof and the amply-filled trolley clinks its way back to the car, beer and wine jostling with black-eye sausage and Scotch beef. There is no hurry, so we walk into town for lunch. A man hastening to cross the road drops his waxed cap so I chase him down and return it. He looks at me as though I’d picked it from his pocket but then thanks me and hurries away with an embarrassed half-smile. His wife grimaces. He probably loses his keys all the time as well. There is soup at the Shore Cafe. Creatures of habit, we cross its corner threshold for the third time, sit at the same table as on the previous two occasions and order. There is nothing spectacular here, although the room has a high ceiling and its feet-on-the-ground service is pleasant. It has an air of being connected with the past. On our first visit I had imagined that Aunty Beryl, my Taid’s cousin who returned from occupied France via Lisbon and Oban in 1941, had taken tea in this very room. By the time my story is passed down, Aunty Beryl will have not only taken tea here but also recommended the home-made soup. I have forgotten my boots. They were filthy from yesterday’s gardening and I had been reluctant to put them in the car overnight, lest we spend 485 miles revolted by the smell of partially rotted grass cuttings and a kicked-over fire. Boots are essentials and not cheap – it’s a good job we didn’t stay in a hotel – and we head to the outdoor shop where, much to my satisfaction, I am left alone to make my selection. Somewhat lighter in the wallet but pleased with my boots, we return to the car and drive to the ferry terminal. Calmac do good ferries and deliver excellent service. Every member of staff we speak to from the first gate, through the check in, during loading and aboard The Clansman, is pleasant and has a friendly word to say. As we hand over our tickets to the man walking the lines of vehicles, a squall rises and a heavy shower rinses his hi-vis coat. Someone in the line hasn’t got their pink ticket, someone else stalls, another is seen running, late, from the terminal building but we’re loaded up and we leave on time. 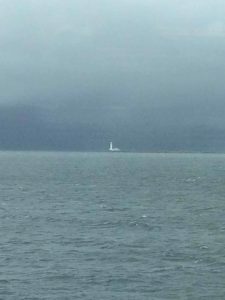 The hills on either side of the Firth of Lorne are barely visible in the grey murk. The breeze stiffens and the bar opens. There is a folk music festival on Colonsay this weekend and it would be rude for the foot-passenger musicians on board to keep instruments in their cases. In keeping with the thoroughly agreeable atmosphere on board, they oblige us with an impromptu set. The ferry makes light work of the rolling swell and a bottle of Colonsay Brewery’s Hangman’s Rock adds a smoky flavour to proceedings. The only black mark comes in the shape of Jo’s ‘prosecco’ which turns out to be a sickly sweet concoction of Italian origin that would do well moistening the compost of a nearby aspidistra if only there were one to hand. A sturdy red takes its place and soon a low-slung skyline comes into view. It takes a little over two hours to Scalasaig, the biggest settlement and landing station for Colonsay. As we return to the car we are engaged in conversation by a group of people from Wales. My Bangor Away Days t-shirt with its British Rail logo is essential wear for…well…away days…and in five minutes we have ascertained that one of their number owns a house on the island and he is acting as tour guide. Dolgellau and Harlech are represented. Small world. A jolly man hands us a welcome pack as we drive down the pier. We’ve seen him before. He’s welcomed many people to this wondrous place, each one with the same enthusiasm, rain or shine. To set the scene – at Scallasaig there is a smattering of houses, a hotel with a bar, a shop with a post office, a brewery, a cafe, a bookshop, a village hall and a craft place. Further afield, a golf course where you can play a round for a fiver, adjoins an airfield where you can catch a little plane to the mainland and there’s the laird’s house where a cafe serves lunches and afternoon teas on prescribed days. The tableau described, whilst useful, tells a very short story – Colonsay is an unwritten play about discovering your soul. As the ferry turns about, churning the bay, wavers wave farewells and the incoming travellers disperse. 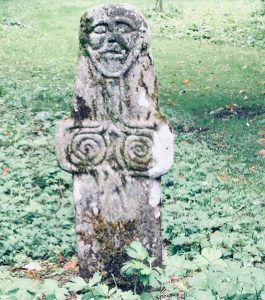 The rain will teem, the sun will burst through and Mull and Tiree, Jura and Islay and Iona (if you’re lucky) will hold promises of future adventure. For now we take the single track road that ducks and weaves it’s way to Uragaig, past crags and lakes, sheep and cows. Before the final pull to our lodgings, Kiloran Bay enters the frame and our mouths shape involuntary ‘wows’…again. The day is fading but the sand is luminous against the backdrop of Carnan Eoin, the island’s highest point and it’s a spiritual moment. Could anyone not be moved by this sight? At our lodgings, half a mile further on, up the rough tarmac rollercoaster, we unpack the car, darkness falls and the rain begins. Proper rain. 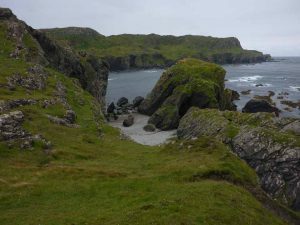 At Port nam Fliuchan, there are caves, curiously polished rock shapes on the beach, a pair of massive highland cattle grazing amongst the pebbles, a natural rock arch and an ancient fort, from which you can look 150 feet straight down into the sea if you are brave enough to risk the gusts. I’ve spent hours exploring here before, so today I bypass these wonders and strike half-left from the beach and pick my way above and below the ever-present outcrops to the summit of Beinn a Tuath. Let’s be clear, we’re not talking mountains here but we are talking rugged terrain. This is all pretty pathless stuff. The sheep tracks lend faint clues to the shortest distance between two points but mostly, navigation is undertaken by the ‘nose’ method. The map identifies the tops and a careful reader will readily connect them but underfoot, it’s rough going. From Beinn a Tuath, as is the case from many of the MacPhies (the name given in ‘Munro’ fashion to Colonsay’s hills over 300 feet) the panorama is wonderful. That’s enough said – a list of visible highlights would take a whole page. From here I trip(!) 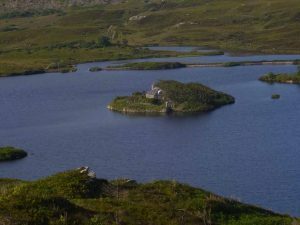 my way down through the heather to the outfall of Loch an Sgoltaire, with its boathouse and it’s castle, the remains of which are tucked amongst trees on an island. The lake’s setting is pure ‘mountain’ and yet here I am a shade over half a mile from the roaring Atlantic. This is the essence of Colonsay. It captures the wonders of the West and places them all on an island about ten miles by three or four. I turn northwards to complete my circle. Over Beinn Bhuide, on my way to Beinn an Sgoltaire, I pass a thicket of trees crammed into something of a ravine. They might not be particularly ancient but their generous clothing of lichen makes them look other-worldly. The photographs I take won’t do them justice. At the summit of Beinn an Sgoltaire the eye is drawn eastwards over Kiloran Bay towards the highest point on the island, Carnan Eoin and the mystery of what lies beyond. Charlie and I left Kiloran’s butterscotch sands two years ago to scramble up Carnan Eoin and I determined to one day go beyond its ramparts and take the track to Balnahard. Not today, though. Within fifteen minutes I’m back at the house, mug in hand. I’ve been out for around an hour and a half. Jo informs me that she read some of her book and looked out of the window and that looking out of the window won and that the changing light over Mull and Tiree compelled her. The sheep in the Croft bleat their complaints as they eye the riches of the garden. 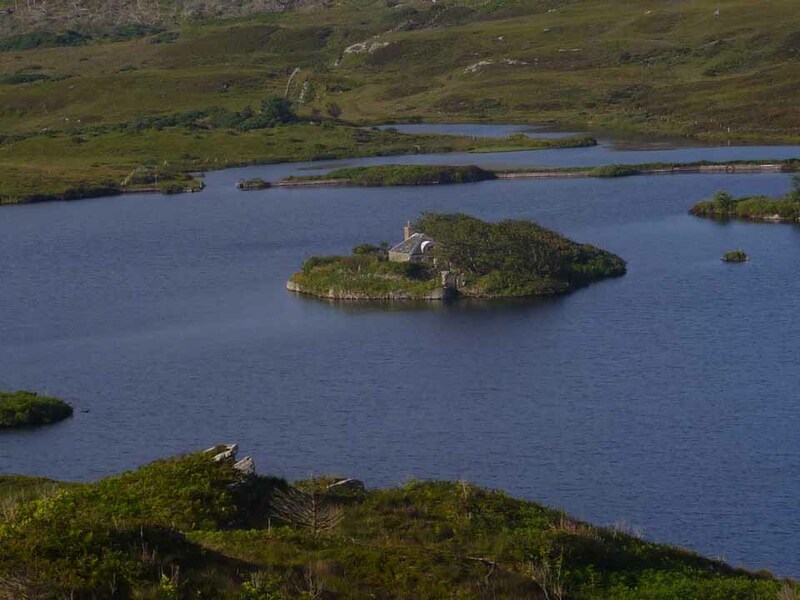 Later, we drive to Scallasaig by way of Upper and Lower Kilchattan, past the trio of lakes called Loch Fada. The beaches on our right demand attention. Take a straight line west from here and you’ll reach Canada. 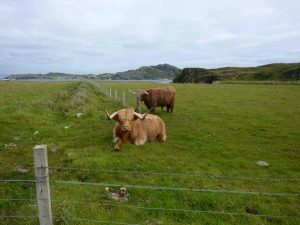 The level of fascination never dips, the light never stays the same, every twist and turn of the single track circuit of Colonsay – the B8086 and the two miles of the B8085 to Oransay, reveal new treasures. It’s time to go to the pub. The Colonsay Hotel is well-appointed. It wouldn’t do for it to be stuffy and self important, so whilst the dining room around the corner is definitely of a higher brow, the bar is clean, plain and a fertile space for people-watching. This year, the added twist of the folk festival has delivered a good mix of musicians, fans, tourists and locals. The staff deal patiently and politely with the randomly delivered and ever-changing requests of one group in particular. It is apparent that they too live close to the Atlantic but some few thousands of miles from here. Wallets stuffed, a new note for each purchase, their orders mount as we wait. Everyone’s needs are suspended until, having paid again, a final Irish coffee is remembered and delivered. Eventually, we settle down with our drinks and chat as this small world goes by. Remember the Hangman’s Rock, remember the brewery? 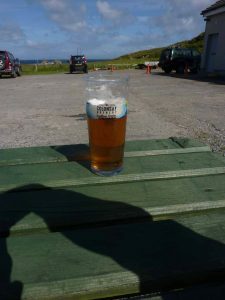 Colonsay’s ales are grand – pricey as you might expect – but tasty and worth the extra. 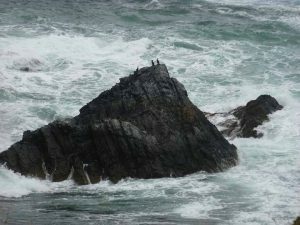 We meander home by the same route and Jo takes a series of stunning photographs, the fifteen minute trip taking thirty. It’s impossible not to stop and just…look. There’s a big house. The Laird lives there. Laird is just lord said in a Scottish accent. The big house has a garden chock full of interesting trees and shrubs and a tea shop in a shed. The interesting shrubs and trees need some work. The Earl Grey passes muster, the millionaires shortbread is sweet and one of the cypresses has a renowned girth. There are big houses with gardens everywhere and they all have claims to fame, specimens from the empire, underground heating or unusual botanical wonders. This is another one. It could be anywhere. It’s not part of the unwritten play, it’s just another monument to the exercise of power and its garden can’t disguise that. Here on the top of Beinn Bheag, not that far from the Big House (but far enough) I’m satisfied with my trek to Traigh Ban (or Balnahard Bay). I took the farm track all the way there but on the way back, just after the farm I followed the telegraph poles across country, reasoning that someone had to get the poles there in the first place and that the ground would be passable. It was and now I’m perched on another Macfie with a crow worrying around me. It’s entirely possible that I’m eating my Tunnocks tea cake too close to a dead rabbit. Back at the house, the sheep have contrived to push over the half-hearted gate that blocks their path to the garden and are now looking superciliously through the window in between munches. The grass needed cutting. I’ll have a bath. Breakfast is a leisurely event. 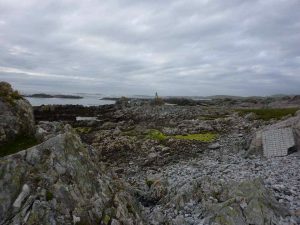 Since time on Colonsay is marked only by light and darkness, adopting a continental approach, albeit to a distinctly full-Scottish plate, happens organically. There is much to recommend about having yet another cup of tea. Gazing out of the window can’t be helped and neither can the chance to put into context the demands of real life – or is this real life? On the first tee at the Golf Club, where I park for this afternoon’s exploration, there is a single bike leaning up against a sign. £5 per round, £30 membership for the year. The bike is not locked to anything and there’s an honesty box for the green fees. I have very little love for golf but if I had to play, this wouldn’t be a bad place to slice and divot my way through a round. I picture an unsteady cyclist, weaving up the road from Scallasaig, golf bag on shoulder, excited at the prospect of playing 18 holes and never having to shout “fore!”. Have I become a ‘bagger’? It takes me ten minutes to get to the top of Beinn Nan Caorach and another hour and a half of proper Rhinogydd style floundering to take in Carn na Cainnie, Carn Mor, Meall a Chaise and Maol Chlibhe. 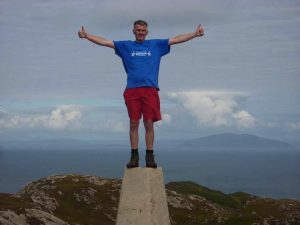 This ‘upland’ area in the centre of Colonsay never gets higher than 400 feet above sea level but once you’re in its grip, you could be stumbling around Moel Ysfarnogod or freestyling on Rhinog Fach. It’s a grey day but the magic remains strong. Whoever made the metal stile that crosses the low fence in the middle of this bog could easily have won the Turner Prize and Dubh Loch, with its one tree and reedy camouflage, is haunting. Another car has joined mine at the first tee. I saw it from Maol Chlibhe and by the time I reach it, Bill and his neighbour’s springer are back from a walk on the beach. The springer’s coils are a little rusty – he’s ten – but he greets me warmly. Bill and I have a chat for half an hour, during which time we discuss life and travel and work and Colonsay and North Wales and discover much in common. I like him. He talks sense and I reckon he’d do anyone a good turn. The early-doors hotel is busy until the Folk festival folk take their leave for the ferry. One man in the corner is staying on a day or two. He looks fragile and explains that he didn’t go to bed until 6am, got up for breakfast and went straight back to bed. It must have been a good session, that. The rain and wind have their say today. Much as the intriguing higher ground of the island beckons me, a beach walk in the rain appears the better option. 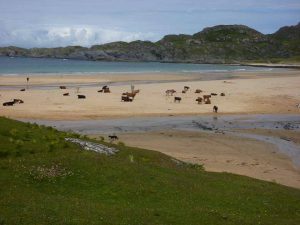 We drive to The Strand, a tidal stretch of sand that divides Colonsay from its Southern neighbour Oransay. At low tide you can drive across, or better still, walk and visit the ancient priory. We did it once and it was brilliant, until a cloud of midges took a fancy to Jo. It’s a different place today compared to our last visit but this only adds to the atmosphere. Hangman’s rock, the local execution site of times past, juts out from its cliff into the grey swirl adding to the overwhelmingly bleak scene. There’s probably no good day to be dangled by the neck from a cliff but victims with a sense of the dramatic, screaming out their last curse upon the world, might have appreciated exiting on a day like today. The Strand, whatever the weather, is a stunning setting and we contemplate it, wellies on, hoods up, as the spray flies. The faint smell of woodsmoke creeps into the bar later as we settle into comfortable chairs and chat over the highlights of the last few days. The first log fire of the season has been lit in timely fashion to greet the forecast of the first major storm. I elect to mark the day with an appropriate Hangman’s Rock and Jo chooses a Colonsay gin, distilled a stones throw from the hotel. On the way back to Uragaig, a rabbit runs across our path and then a smallish rat hurries along the edge of the road, seeking drier lodgings. The high winds have made the news and Calmac are warning of disruption on Wednesday. We drift off to sleep as an invisible hand throws shovelfuls of pebbledash rain at the window. Tomorrow we shall gather our things and board the ferry. There will be a sunburst on Balnahard Bay making it momentarily appear as a luminous strip of gold brushed across the grey horizon and then Colonsay will diminish from view and the seeds of the ache to return will be planted once again. John, it’s always welcome when I see on Facebook you’ve posted an entry onto your web site. A sign for me to brew a cup of tea and settle down for a few minutes welcome break from the tedium of work. Really enjoyed the read. What a wonderful advertisment for Colonsay. Absolutely wonderful writing John. Reminds me of my travels round Mull and folk festivals on Barra. Wonderfully evocative as ever.